It's W.I.P. Wednesday at Freshly Pieced and I am linking up today with some blocks I have been working on for Charity quilt projects. First up are quilt blocks that I am sending out in the mail (hopefully today) to the U.K. to Little Island Quilting. She has asked quilters to send her 12 1/2 inch quilted blocks, or whole quilts if you can, to distribute to children in a home for street children of Mexico City. Check out her Jan. 2 and Jan. 5 posts on her blog if you want to get involved. I posted last week on my blog about my friend who is too ill with cancer to sew anymore and she gave me an amazing gift of a Juki sewing machine. She also gave me three file boxes of fabric! Inside one of the boxes was this postage stamp block. I added the borders to make it 12 1/2 inches. I am not the greatest machine quilter so I am a bit nervous to send these off. I hope they are okay. I made these two pinwheel blocks for the Mexico City project and quilted them with stippling. And I found this red and white block in my stash which I tried to echo quilting on. So, I hope these blocks will work out for the project and help to make a difference. These next four pictures are of slabs I have made for my Quilt of Valour project. The smaller slabs will be cut into maple leaves which will be appliqued onto a piece of white fabric. The larger slabs will be cut in half to be the sides of the Canadian flag. The quilt will be a rainbow of Canadian flag blocks. This slab technique is new to me so I hope I am getting it right. It's good for using up scraps that's for sure. This project fulfills two goals: to sew a quilt of valour and to use up some of my sizable scrap collection. 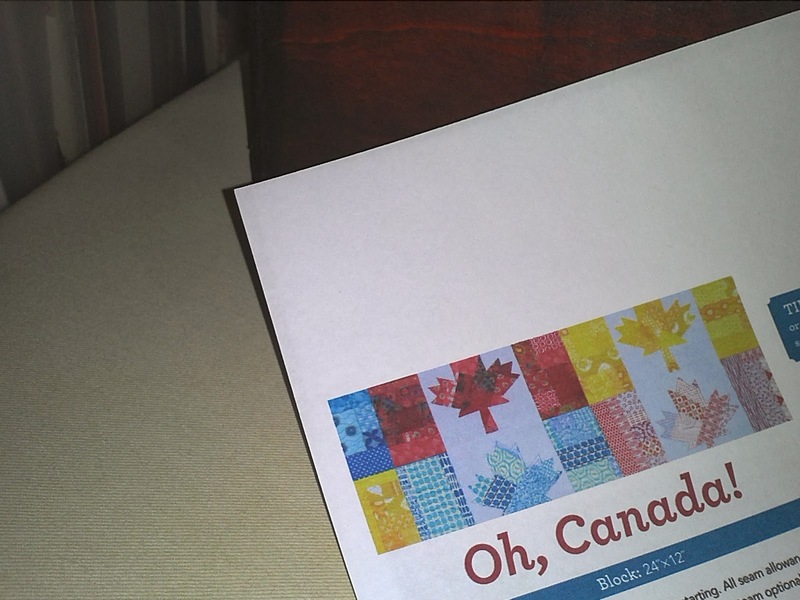 ﻿I am using Cheryl Arkinson's Oh, Canada pattern for this project. So those are my WIPs this week. I am linking up with Freshly Pieced today. Thank you for visiting my blog!